Vol. 9 – Guess Who? I'm old. I realize I'm older every day that I wake up and am not yet dead. When my knees ache from having played dodge ball with my kids, when my beard looks more salt than pepper, when I see guys I remember on draft day now being inducted into the hall of fame, I feel old. Back when I was a kid, I played a game called “Guess Who?” in the car with my brother on road trips. This was back before the days of even generation one Nintendo Game Boy. Back then we had travel versions of popular board games that you could play in transit. Usually they were created with smaller pieces that were magnetic or at least had storage slots that ideally kept you from losing pieces. Someone would always lose the most important pieces in between the seat cushions anyways. Kids are careless. Guess Who? is really a game that you could only get away with inventing in the 80's. Manager: We need an idea for a new game that kids and parents will love? Designer: Let's teach kids to differentiate people based purely on their most egregious physical features with no concern for their character or personality. I remember learning to ask endless questions like, “Is your character a fat, white, balding guy with a hawk-like nose?” THAT'S A TERRIBLE THING TO ASK. At the time, it was just harmless fun to pass the time on seemingly endless drives through the Canadian wilderness, but thirty years later it feels a little cringeworthy. How this game continues to thrive is beyond me. All this being said, there is value in learning to be able describe what it is exactly that you're seeing. Learning to differentiate between things of value and veritable trash is important in life and in DFS. Just ask any kid who's even been panning for gold and would up with a little glass vial of iron pyrite. One of the trickiest parts of learning NBA DFS for me has been trying to figure out the difference between a good cash game play, a good tournament play, and which players are just bad plays. As a guy who's been a casual NBA fan most of my life, it's tough to know who the consistent performers are versus who the mercurial players are versus the players who are just bad. There are certainly distinct differences there. Coming into this NBA experiment I had a pretty good handle on what made good cash or GPP plays in MLB and NFL. In cash you want high wOBA with weak pitchers and high scoring players facing weaker defences with positive game scripts. In GPP's you want high ISO with splits you can exploit and high volume players facing potentially tougher matchups. Obviously, this vastly over simplifies things, but it's a good starting point. There are always angles to play. When it comes to NBA players, it wasn't quite as intuitive to me who and what the best plays were in different contests. Even now I'm still working hard each day to try to get a handle on it, but I've come to a few different understandings that are helping me out in lineup construction for different contest types. In full disclosure, I've started playing some cash games again. I've made my peace with the unparalleled volatility in cash game cash lines in the NBA that I wrote about a few weeks ago. I still think that building lineups looking for 5x value is a fool's errand, but looking for players that consistently hit that value is helpful in evaluating players for cash game suitability. One of the lesson's I had to learn early on in my DFS days that I certainly didn't understand immediately was that being contrarian doesn't mean playing bad players for the sake of low ownership. Good tournament plays are often good players in tough matchups or mediocre players in great matchups. The other player type that I've come to know in the NBA are inconsistent players with justifiably depressed price tags. They are often players that are entirely dependent on one scoring category for their production and, as such, have a lot of variance in their scoring from night to night. Markieff Morris and Jamal Crawford come to mind immediately. On the nights that they are hitting their shots, they can easily score 30+ fantasy points with a $4000 price tag. You will love them. You will wonder why you don't play them every night. You will name your ill-fated children after them. Then you will play them every night, they will go cold for a week as shooters do, and will supply you with only 5-10 fantasy points instead. You will want to send them on a spaceship to the sun. Tournaments by their very nature though are best played to shoot for the moon or crash and burn. The middle 80% of the field is where losses pile up and bankrolls go to die. If you're just playing to cash you may as well just stick with double-ups and triple-ups where the margin for error is greater. Mercurial (editors note: after seeing this word for the second time, we had to look it up) players in good matchups make for great tournament plays. You could try combing through pages and pages of game logs like a sucker, trying to figure out who is who, or you could just use a page like the “Scoring & Values” tab in our NBA premium tools. There, you can find two great statistical breakdowns to help you discern cash game plays from GPP plays, from guys who have no business ever being one of your plays. The first page that comes up is the “Points” tab. This quite simply lets you know how often a given player has reached a specific fantasy points threshold on the season. This can be pretty helpful in letting you see who the highest fantasy producers are regardless of price tag. It can also be pretty handy for helping you spot consistency. As you go down the price scale you can see that the percentage of nights a player reaches higher scoring thresholds descends accordingly. Russell Westbrook is basically 100% across the board up to 30 points per game, and even after that he reaches 50 points an unbelievable 86% of the time. One of the interesting bits of information it can feed you too is the odd player who's dreadfully inconsistent, but also has high end scoring ability like Elfrid Payton. He'll reach 20 fantasy points only 69% of the time. DO NOT ROSTER AN ELF IN CASH GAMES! That being said, he does have the ability to reach all the way up to 50 fantasy points a solid 8% of the time. No one else in his price range has that kind of high end ability. On the right night, when all the stars align and Alpha Centauri is in the third phase of its fifth rotation around Omicron Persei 8, he may be worth a shot in a GPP. Taking the time to sort through these charts regularly can really help to acquaint you with the abilities of players you may not be that familiar with. Markieff reaches 5x value at his current price tag only 36% of the time. There is a 64% chance that he will disappoint you. Markieff LIVES to disappoint you. However, he is also good for 6x 24% of the time and even 7x 15% of the time. If you catch him on a hot shooting night, he can provide exceptional returns at a lower price because of the volatility inherent in his scoring. On the opposite end of the scale is a player like Kawhi Leonard. At his current price tag, he is good for 5x value a solid 55% of the time, but he rarely gives you an exceedingly high score. He only reaches 6x value 12% of the time and has not exceeded 7x value at any point this season. This is what we mean when we talk about high ceiling versus high floor players. There are of course rare instances in which you can find both of these characteristics in one player, and these become core plays on a given night. Damian Lillard is priced all the way down to $8000 on DraftKings right now and at that salary he's been good for 53% at 5x, an astounding 38% at 6x, and amazingly even 19% at 7x value. Much of this depression in his price tag is due to his recent injury, but when he returns it will certainly be an opportunity to take advantage of. Take the time to figure out who's who in the NBA and it will pay dividends in your bankroll. This was a little bit of a low volume week for me with all the holidays and time spent with family. The late breaking injury news on Chris Paul/James Johnson and the struggles of Derrick Favors the other night really put a damper on what would otherwise have been a really profitable week. I don't regret any of those decisions as they would have put me in great spots had the news broken my way instead of against me. Eventually variance will be in my favor through taking calculated risks. 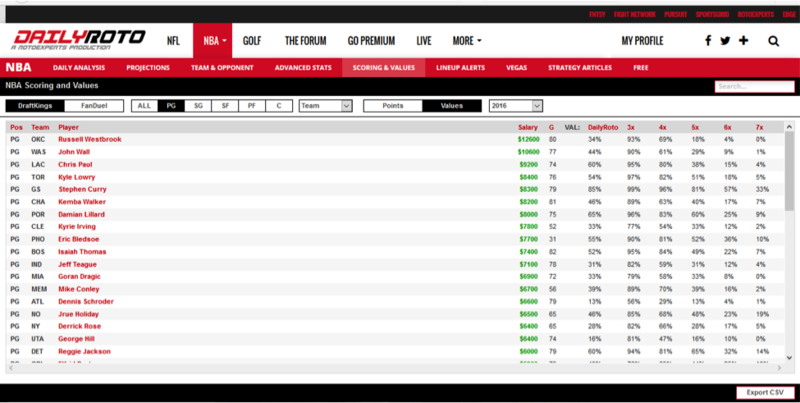 There are inherent challenges in playing to win tournaments without the benefit of late swap on DraftKings. I miss late swap. So much. Please DraftKings, bring back late swap. Anyways, here's to hoping you have a wonderful and profitable 2017!